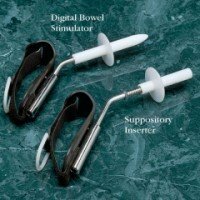 Digital Bowel StimulatorHook and loop handle is ideal for people with quadriplegia or limited hand use.Both the Digital Bowel Stimulator and the Suppository Inserter are constructed from stainless steel with polyethylene collars and tips. The D-rings on the quad handles allow for easy adjustments. The stimulator has a 2Ò (5.1cm) long, firm insertion tip. The inserter has 2Ò (5.1cm) long, hollow plastic tip that holds a standard suppository. Spring-loaded design pushes the suppository out. Both units measure 8-1/2Ò (22cm) long, and can be sanitized easily.This is the Digital Bowel Stimulator only. The Suppository Inserter is sold separately. This is an hygiene product and cannot be returned. Product photo may not exactly match the product offered for sale. Please refer to the product description.